8/23/11 UPDATE: The winner is Laura Pauling! Congrats, Laura! I’m giving away some books! These are all books I’ve read and loved and recommend without reservation. Which means I’ll be buying actual, finished copies. Which means it’s time these ARCs did their job and got read and loved by other people. To win, all you have to do is leave a comment here. No following anyone anywhere, no gimmicks. On August 22, I will use random.org to select a winner. Winner take all, open internationally. I’ll accept comments until midnight EST on Aug. 21. Waaaaant! also, you have a *batman* emoticon. What exactly does that get used for? Vengeance? OMG! You are so wonderful for giving those amazing, shiny books away! Thanks for the giveaway! I can’t wait to read The Girl of Fire and Thorns! Ohhhh my GOODNESS want. All of them. Especially your book and Name of the Star. But really . . . ALL OF THE BOOKS. Oooooh. I’m all over this. Thanks for such an awesome contest! AWESOME! I’m so excited to read these books (even the ones I hadn’t heard of before now). Thanks for offering this giveaway! Thank you! Win or no, I cannot wait to read The Girl of Fire and Thorns. I’d love to give these ARCs a solid read! Just started a Readlicious! 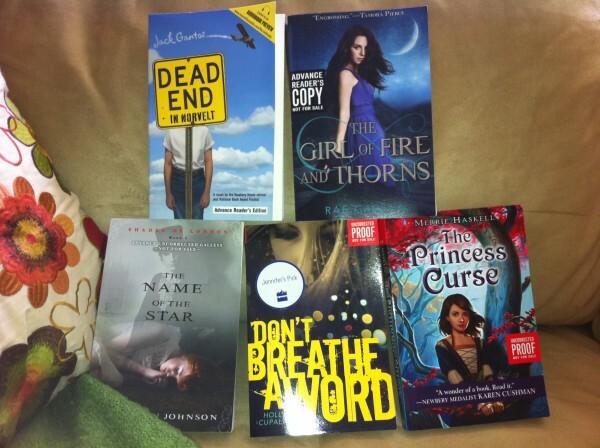 blog with book recommendations for tweens/early teens. Ooh! I really want to read The Name of the Star!! Thanks for te awesome giveaway!!! Rae!! What a wonderful giveaway! I covet books and can’t wait to read yours! I’m also excited to read some of your faves! I’d love a chance to read any of these! Thank you Rae! *groupjump* Awesome giveaway….as awesome as the cool emoticons you have! Wow, that looks so great! I’d love to read those! I am dying to read all of these books! I hope I win one! Wonderful giveaway! I’d love to read all of those books right now!! Thank you so much! Oh, wow, several of these- including yours :D- are ones I have been massively looking forward to. Congrats on the upcoming book birthday! It would be so awesome to win these! Thanks! ooo ooo ooo, me me me. Thanks. My guilt stack is getting lonely. I cannot believe how awesome this giveaway is! I am crossing my fingers and toes hoping to win! AWESOME GIVEAWAY!!! thx so much! Wonderful giveaway! 🙂 Thank you for this chance to win such amazing books! Thanks so much for the very generous giveaway!! 🙂 Such great titles! OH. MY. GOSH. Thanks so much for the giveaway!!! *mad* Whoot!! Thank you for the giveaway! 🙂 I’m crossing all my crossables! Oooooh! Pick me! Pick me! The Princess Curse sounds so good. I WANT. Also GoF&T. Also all the rest. I’ll pray to the random generator demons. Me, me, me! These all look awesome and I, of course, would love a physical ARC of Fire and Thorns to hold onto until I get my shiny finished copy. Thanks so much! Humbly, I roll the dice, and kiss the hand of Lady Fortune. May one of these lovely books be MINE. DO WANT! Please enter me. Thank you for doing this! 😀 Nice to see books keep going after a read. thanks so much for this! i have heard great things about Fire and Thorns! The new blog looks amazing! Dear Rae, you’re super nice.. I can’t believe you’re giving away all these books. I’ve already won a copy of The Girl of Fire and Thorns but I would so love to read The Name of the Star, Don’t Breathe a Word and all these books. Thank you so much Rae! I’m so looking forward to your book! Really looking forward to reading your book! Loved the excerpt! How generous! I’ve been looking forward to a bunch of these, especially GoFaT! Amazing giveaway! Thanks for your generosity! Wow. These are all books I’ve been wanting to read! Thanks for the chance to win! They all sound wonderful! Thank you. YEEEEESSS! These look so good, especially Girl of Fire and Thorns 🙂 Thanks! I hardly ever enter these, but…I really want to win this! Yay! Really looking forward to your book! I would absolutely LOVE the copy of Name of the Star, with all my heart, but I would gladly read the others! *groupjump* Thanks for the chance! They’re all books I’d love to get my hands on. Loving your website, especially the Godstones all over. Thank you for the opportunity! Sign me up! I am so excited to read your book! I can’t believe my library hasn’t ordered it yet… but I am working on it. 😉 Thanks so much for the awesome giveaways. Thanks so much for the wonderful giveaway! I can’t wait to read your novel when it comes out. I appreciate the chance to possibly win it early! Yay! And thank you. =) These are pretty much all on my most-anticipated-of-the-year list! You’re so awesome, did you know that? Thanks for the contest and good luck to everyone who enters! Awesome giveaway!! I want to read all of those books!! Oh. My. Gosh. :O *grab* Thank you, and can’t wait to read TGoFaT! Oh, I so want these books! Keeping my fingers crossed! That is QUITE a collection of ARCs 🙂 Thanks for the giveaway! Oh wow! I was lucky enough to read The Girl of Fire and Thorns from NetGalley…but I loved it so much I would love an ARC copy…and signed no less! I really want to win this one!!!! thanks for the giveaway!! And also, You’re book sounds very very interesting. Can’t wait to get my hands on it! And both of the covers are really really great! If I am lucky enough to win, I’ll spread the word (review and stuff) with my friends around here and the net! what beautiful ARCs! I’ve never read one before. *-* thanks for the chance! Always looking for something new to read. Thanks for the giveaway! Throw my name on THAT hat please, Rae. Thank you! These look so good! Thanks so much for the giveaway! Laura Pauling, you won! Email me your mailing address (raein2004 at-sign gmail dot com), and I’ll get the books shipped to you ASAP. Congrats! Yay! I’m so excited! I’ll send you my email tonight. Thank you so much!